You will be given a reference e-book to read which has 660 pages And the test will be based on that e-book , you can take final test within 1 year of purchase. If you want to know exactly how the Job Control Language (JCL) works, then you should know that enrolling in the JCL certification program from Brainmeasures works in significantly raising your awareness in the field while also transforming you into a JCL expert. 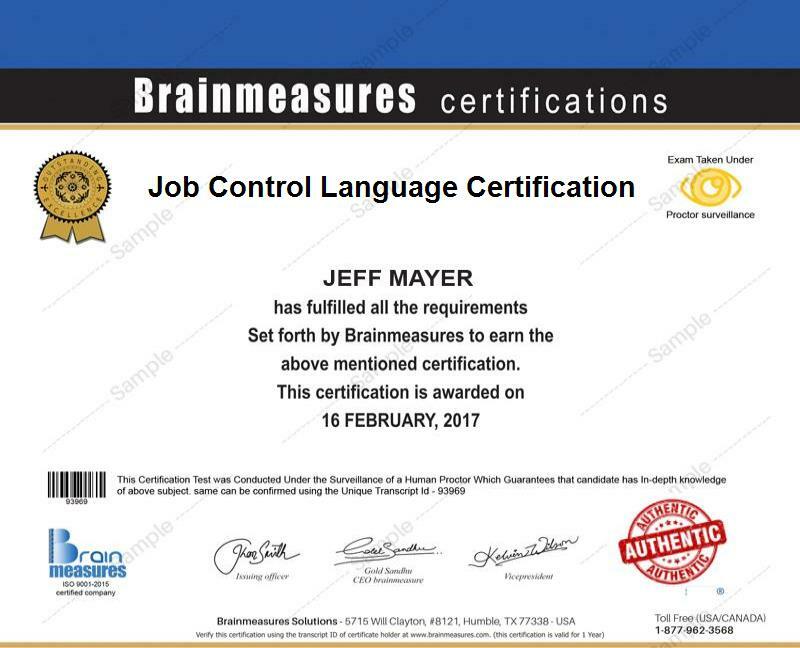 The job control language which is now part of the many highly reliable certification programs from Brainmeasures allows you to embrace all the concepts, features and strategies linked to using JCL. This online certification course is proven to be really effective when it comes to improving the level of your proficiency in the field and in honing your skills in using JCL so you will have an easier time showing your competence in the organization which you are planning to provide your expert services. The JCL training online which you can get from the JCL certification course from Brainmeasures is not only reliable but highly comprehensive as well so improving your skills in this field will no longer become impossible. The program comes with an online JCL exam which was developed by renowned professionals and experts in the JCL industry and you need to pass this in order for you to get your Job Control Language certificate. The exam aims to accurately measure the level of your programming knowledge and skills using JCL and determine if you deserve to finally grab a copy of your certificate and start working in the industry. The JCL certification program which is now offered by Brainmeasures is a major help for individuals and professionals who are planning to understand JCL and its relationship to effective data and job management. This is most suitable for aspiring and existing application and system programmers and any other professionals who are responsible in accurately coding various statements and in effectively entering compatible programs into an operating system. This JCL certification program is also a good choice for end users, JCL specialists, managers, operations staff and technical support staff who are tasked in reading and coding JCL. Presently, JCL certification holders who have decided to start practicing their profession are among those who are earning the most competitive salary in the industry. This means that completing your JCL certification course will allow you to get hired in higher paying positions. The most common salary range for JCL experts is around $34,000 to $97,000 per year. If you work as a senior software developer after you receive your JCL certification, then your annual earnings can reach up to $304,000 according to PayScale.com.